Oh, mason jar – how do I love thee! Let me count the ways… Seriously, is there anything you CAN’T do with a mason jar and a bit of ingenuity? They’re affordable, easy to find, and oh so versatile. And I love the throwback feel of a classic mason jar, don’t you? Even though I’ve never canned a thing in my life! Nope, I use my collection of mason jars for much more than food storage. Here are some of my favorite, creative ways to use mason jars to help keep your home organized without breaking the budget. 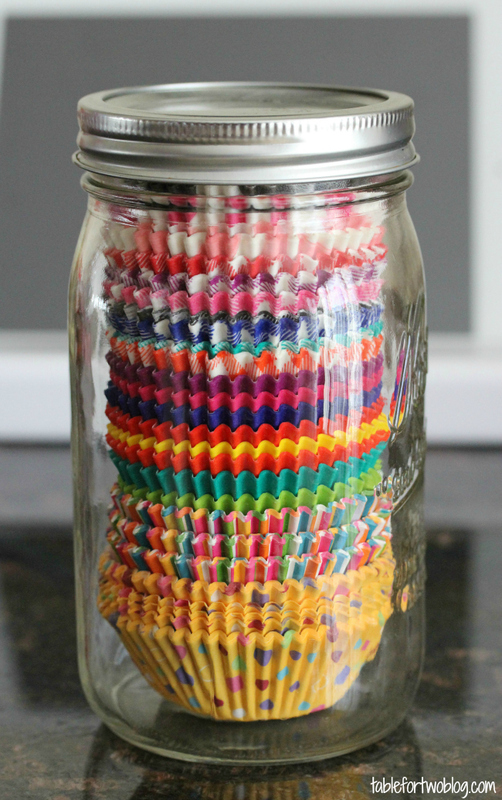 Don’t feel like getting out the paintbrush to snaz up your mason jars? No problem! This tutorial will show you how to use pretty paper to create beautiful, coordinating holders for all your office supplies. What a genius way to get all that bathroom clutter off the counters, but still within easy reach! This project is super simple to do (even if you’re not great with lots of tools). 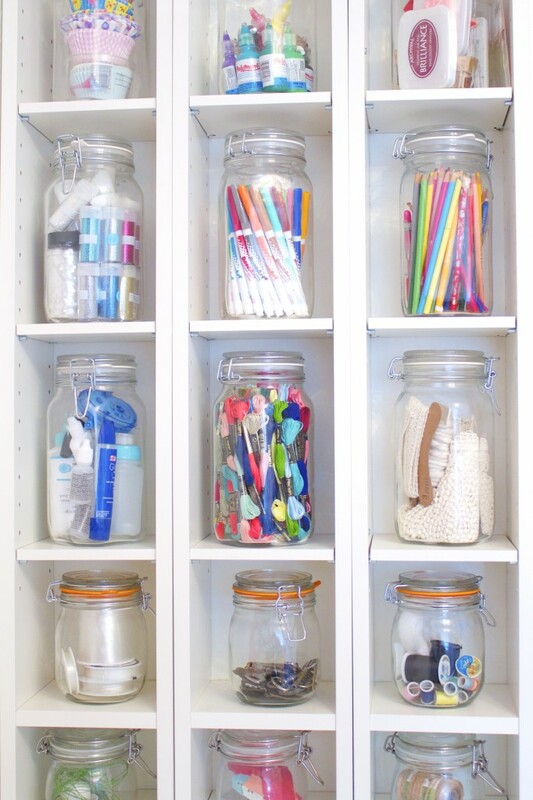 You can use the jars for whatever you need – fresh flowers, toothbrushes, cotton balls, etc. I especially love the idea of designating a jar for reading glasses! Running low on pantry space? Get rid of all those awkward cardboard boxes, and try storing your dry goods and baking supplies in beautiful mason jars. Who knows? You might find yourself more willing to cook if it means getting to open up your stunning new pantry. These adorable little jars make the perfect travel sewing kit. They’re small enough to fit in your cup holder or tuck in your bag when you’re on the go. They’d make cute gifts for teachers too! I don’t know what’s cuter. The kids who use all the crayons and markers in my house, or these adorable pastel mason jars for storing all their art supplies. Just when I didn’t think mason jars could get any better. Tired of all those mismatched, hard to find spice jars? Mason jars to the rescue! Grab some 4 oz. and 8 oz. mason jars, slap on a little chalkboard paint, and tada! 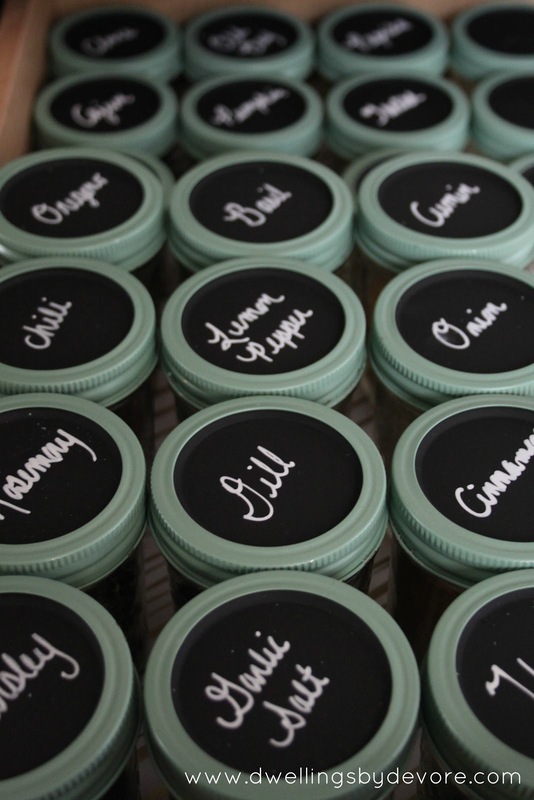 Beautiful, organized spice jars your mother-in-law will be jealous of! Spray paint and duct tape, yall! Spray paint and duct tape. I mean, does it get any easier? 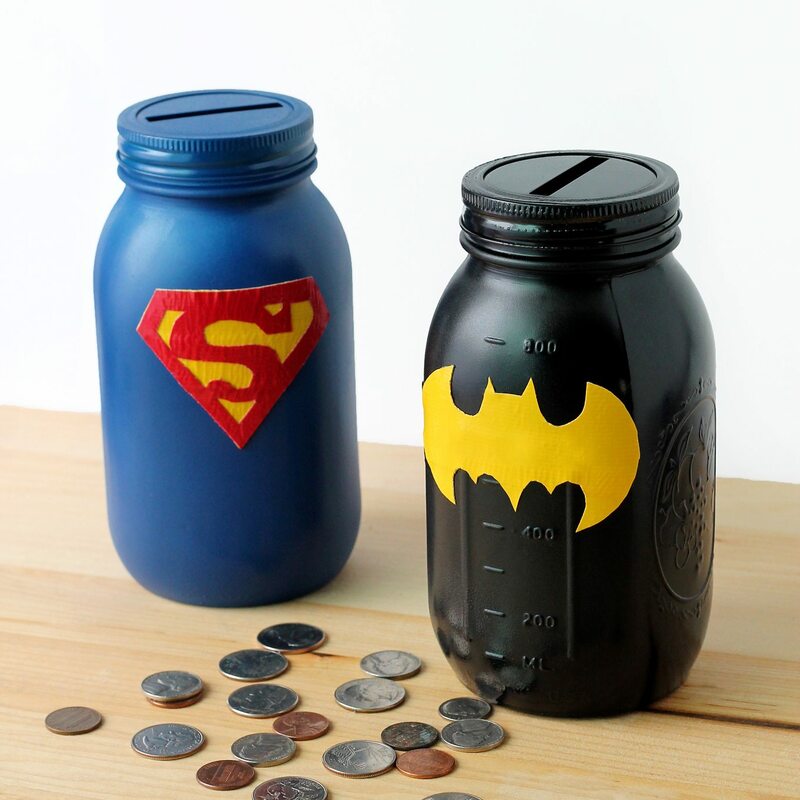 What kid wouldn’t want to start saving their pennies with an awesome superhero piggy bank made like these? If you’re a baker, you know how frustrating it is to keep up with all your adorable cupcake liners and their flimsy plastic packages. Why not stack them all together in a mason jar for an adorable, functional addition to your baking cabinet? Want to know how to get that lovely soft painted look on your mason jars? Check out this simple tutorial from SweetHaute. That’s all folks! I hope you’ve found some new ways to incorporate mason jars into your organizing and decorating. I’m off to get my glue gun!